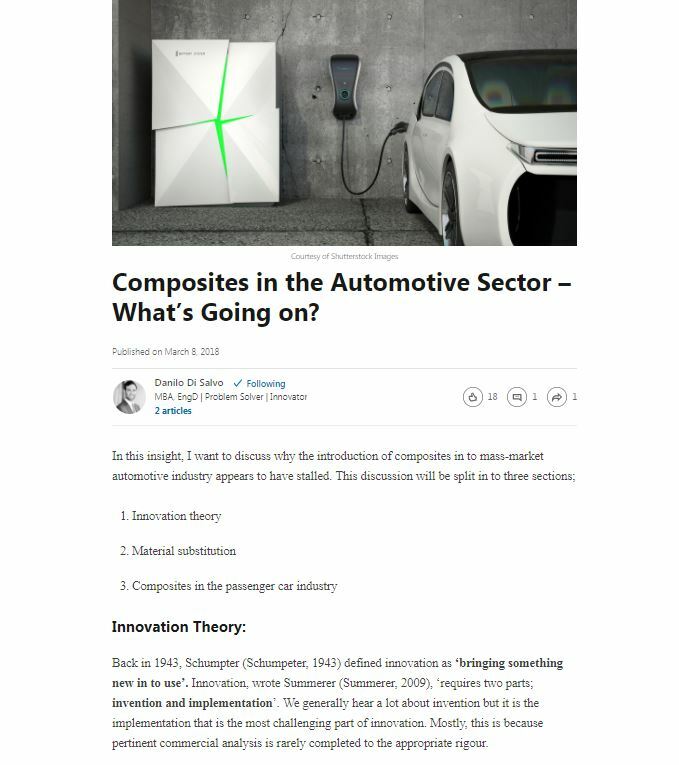 Composites in the Automotive Sector – What’s Going on? Home page/ Insights / Composites in the Automotive Sector – What’s Going on? Back in 1943, Schumpter (Schumpeter, 1943) defined innovation as ‘bringing something new in to use’. Innovation, wrote Summerer (Summerer, 2009), ‘requires two parts; invention and implementation’. We generally hear a lot about invention but it is the implementation that is the most challenging part of innovation. Mostly, this is because pertinent commercial analysis is rarely completed to the appropriate rigour. There are two types of innovation:incremental and disruptive. Incremental innovation (also known as optimisation) is the most common form of innovation. The automotive sector has historically been an incremental innovator – the basic design of a motor vehicle hasn’t changed for the last sixty or so years. In his paper, Summerer (Summerer, 2009) discusses how optimisation is a strong inhibitor of radical innovation. Firstly: new technology is rarely recognised by the market leaders and even when it is, minimal action is taken (also known as sailing ship syndrome). The natural reaction for many large firms is to immediately cut costs to combat a potential new entrant. A particularly powerful example of this is Kodak. Secondly: in most cases disruptive technologies are, initially at least, more expensive than the incumbent technology. This is because the disruptive technology is unlikely to have benefited from economies of scale. Thirdly: disruptive technologies will locate themselves into niche markets primarily before spreading to meso-markets and eventually mass-market penetration, as shown in Figure 1. It is important to recognise the two different types of innovation and further, to distinguish between optimisation and disruption. These two types of innovation require different skills sets and environments in which they operate. Cost is an important factor for composites and I often see things like £/kg or “attribute X”/kg compared to “attribute Y”/kg. This is an oversimplification of what is likely to be the introduction of a new material in to a complex system. A material is almost never chosen due to one attribute alone, so why when we come to introduce composites do we tend to focus on £’s per kg’s? It may be more effective to consider the whole composite system (including manufacturing) rather than as a commodity. Generally, a composite solution cannot be directly substituted for the metallic component. The interfaces to other modules and sub systems are likely to behave differently when a composite is present. It may be quicker simply to insert the composite in to the product but it is highly likely that the product’s overall performance or capability will be compromised. The most common issue that I see is the use of metallic design processes for composite materials. Composites behave differently when compared to metallic systems; primarily composites are non-isotropic and do not deform plastically (at the macro scale). Further, there are also a myriad of different manufacturing routes for composite materials, all of which provide the finished product with subtly different characteristics. This makes Design for Manufacture (DFM) for composite materials not only important but fundamental. With the urgency in developing electrified vehicles, it can be argued that lightweighting has been pushed to one side. The major OEMs are pouring their R&D money in to battery research and electric technology development. This has left a shrinking pot for lightweight materials, namely composites. The weight of vehicles has steadily risen over the last thirty years. Indeed, vehicle weight is set to increase even more with the introduction of batteries. 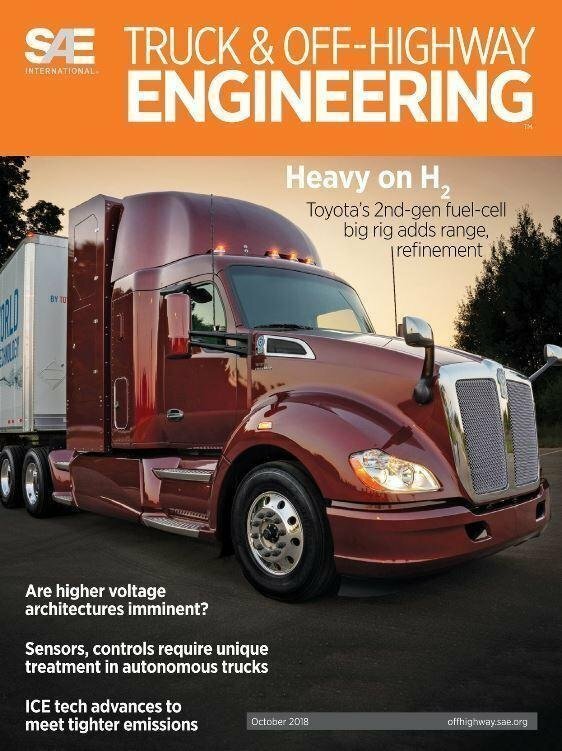 To mitigate range anxiety, OEMs have been including larger batteries in to their vehicles. In addition, to counter the increased price for xEVs, a range of luxury extras are often included. Again, these further add to the weight of the car. Adding weight to a vehicle lowers the efficiency as the motor must move more mass and hence requires more energy. 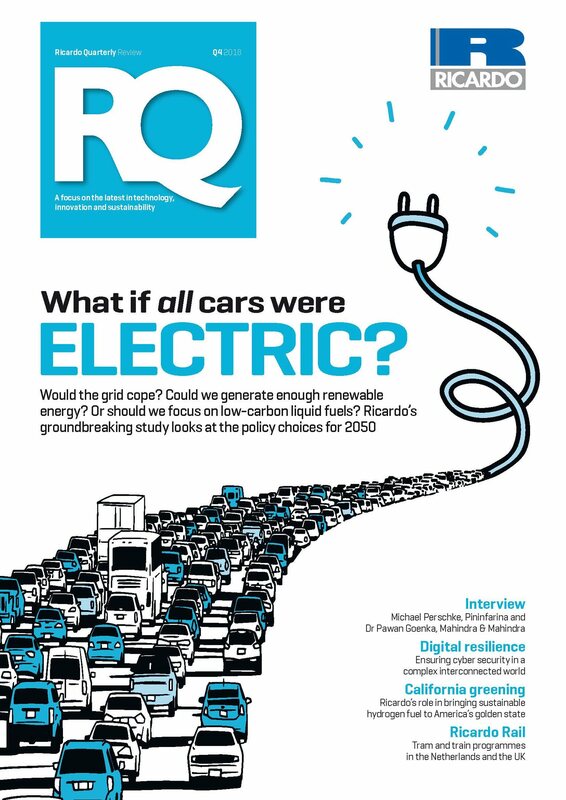 Therefore, a lightweight material should be a complementary technology to electrification. Composites are lighter and stiffer than conventional metallics. So why are they not prevalent throughout the industry? I think that Figure 2 can shed some insight. Let’s assume that steel is the 1st technology, aluminium is the 2nd technology and composites are the 3rd technology. it’s not at all surprising that composites are not widespread throughout the industry. What is clear is that we have not reached the switch-over point, shown in Figure 2. This is the point at which the new technology facilitates increased product performance compared to its predecessor. I think that a potential answer lies within the theory of innovation. The automotive industry has been incrementally innovating for the last sixty years and consequently disruptions are harder to deal with. Both battery technology and composites can be viewed as disruptorsbecause they change the way that the OEMs make and operate their final product. In Figure 1, Hardman (Hardman, et al., 2013) recommends that disruptors start in the niche segment before moving up the market share curve. For composites, the niche market is active and successful (think hyper- and super-cars). The next logical step should be to enter themeso-market, for example luxury and sports cars. One way to introduce composite technology in to this segment could be to employ‘skunkworks’-like teams that are based away from the core business. In this way, they can be free from incremental innovation (that inhibits disruption) and focus on developing disruptive technology. A closer relationship between composite manufacturers and the OEM’s could facilitate a smoother transition from one S-curve to the next (see Figure 2). This is because DFM is so vital to obtain the best performance characteristics. Consequently, a close relationships between the whole value chain become crucial. For the longer-term benefits that are provided by disruptive technologies, the initial penalty of lower economies of scale need to be endured. As such, partnerships across the automotive landscape will lower the impact (in terms or cost and risk) to individual businesses. As Hardman (Hardman, et al., 2013) showed, businesses that react by cutting costs against disruptors have consequently faced difficult futures. Hence, by acknowledging new and disruptive technologies, and by investing in them early, long term growthbecomes more likely. Danilo is a Senior Consultant at Ricardo Strategic Consulting and a guest lecturer in Strategy and Strategy Innovation at Warwick Business School. 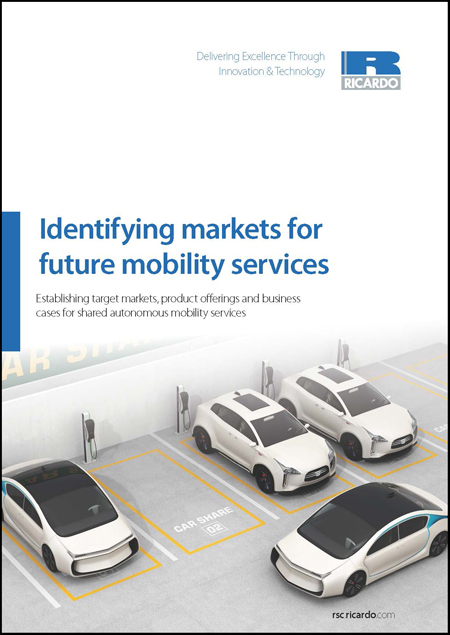 This is an extract from a Ricardo Strategic Consulting white paper exploring composite market entry strategies in to a number of sectors, including automotive and rail. Christensen, C. M., 1992. Exploring the Limits of the Technology S-Curve. Part I: Component Technologies. Production and Operations Management, 1(4), pp. 334 - 357.